Olentangy Orange’s Griffin Runyon (9) streaks down the sideline for a long punt return during the first half of Friday’s league opener against visiting Westerville North. The Olentangy Orange football team dominated from start to finish on the way to a 26-0 win over visiting Westerville North in Friday’s OCC opener in Lewis Center. The Pioneers (6-0, 1-0 OCC) scored in every quarter to slowly pull away. The game, though, was pretty much never in doubt as the Orange defense allowed next to nothing. The Pioneers, who jumped out to a 6-0 first quarter lead thanks to a pair of field goals from Grant Simon — the first from 30 and the second from 34 yards out — finished with 277 yards of total offense. The Warriors, meanwhile, managed just 32. Orange made it 12-0 when quarterback Luke Schmeling found Zach Harrison for a five-yard touchdown strike with seven seconds left in the first half. The ensuing extra-point attempt was blocked, but it hardly mattered. The Pioneers pretty much put the game out of reach when Schmeling and Harrison hooked up for another five-yard TD late in the third quarter. Jack Applegate officially put the game on ice with a 20-yard touchdown run midway through the fourth to smooth out the scoring summary. Schmeling completed nine of his 27 passes for 108 yards and the two TDs. He was also the team’s leading rusher, finishing with 65 yards on 10 carries. Graham Starn was next, finishing with 58 yards rushing while Manny Anderson was the game’s leading receiver with six grabs for 76 yards. Bryce Houston and Jack Neer both had interceptions to help the defense pitch a shutout. 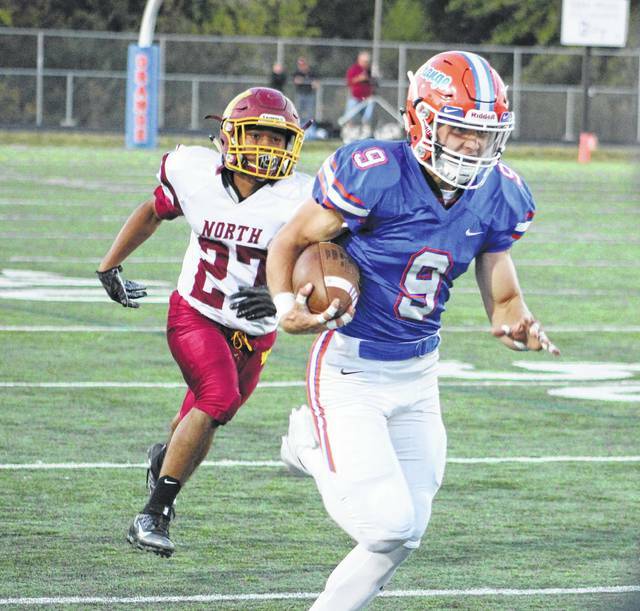 The Patriots started strong and rallied late, outlasting the host Warhawks 31-28 to open league play Friday in Westerville. Liberty (4-2, 1-0 OCC) led 17-7 at the break. Aiden Kenley broke the scoring seal with a one-yard TD run less than a minute into the game and, after Central’s Isaiah Healy hit Ashton Gilkey for a game-tying 11-yard touchdown, Mitchell Kershner connected on a 24-yard field goal to put Liberty back on top. Patriot QB Mitchell Okuley made it 17-7 when he hooked up with Ben Roderick for an eight-yard TD with a minute left in the first half. Okuley scored on a 27-yard keeper to make it 24-7 midway through the third, but the Warhawks scored three unanswered touchdowns to take a brief lead. Healy hit Myles Williamson for the first, Drew Fischer for the second and Cameron Phillips from 24-yards out to give Central a 28-24 lead. Liberty wasn’t done, though, scoring what proved to be the game-winning TD when Okuley connected with Roderick from 28 yards out with 3:36 to go. Okuley completed 17 of his 31 passes for 155 yards, two TDs and an interception. Central’s Healy, meanwhile, completed 23 of his 32 passes for 238 yards and four scores. Central’s Allen Smith was the game’s leading rusher, closing with 107 yards on 20 carries. The Golden Eagles picked a good time to win their first game, opening league play with a lopsided decision over the host Wildcats Friday in Newark. Nathan Lawyer capped Big Walnut’s (1-5, 1-0 OCC) opening drive with a three-yard TD run and the Eagles never looked back. Quarterback Tyler Ronk scored on a keeper on a fourth-and-goal play from the one-yard line midway through the first quarter and Lawyer scored on another three-yard run to balloon the margin to 20-0 by the end of the first. Lawyer’s third touchdown of the game made it 27-7 with 6:22 left in the opening half, Eli Myers made it 33-7 with a three-yard run three minutes later and Ronk hit George Derenburger from 24 yards out to make it a 40-7 game at the break. Also: Olentangy 42, Westerville South 23; Worthington Kilbourne 31, Delaware Hayes 0.
https://www.delgazette.com/wp-content/uploads/sites/40/2017/09/web1_oo9.jpgOlentangy Orange’s Griffin Runyon (9) streaks down the sideline for a long punt return during the first half of Friday’s league opener against visiting Westerville North.